Teeth are important no matter who you are. They help you chew your food, make a good impression, and are great indicators of overall health. Cirocco Dental Center can help you get and maintain the smile you want, but did you know your pets can also benefit from dental checkups? If not regularly taken care of, your pet can develop periodontal disease, which is a bacterial infection of the mouth. This goes beyond the plaque that has accumulated on the surfaces of the teeth you can see. Severe periodontal disease is the result of excessive plaque buildup (known as calculus) that can extend beneath the gums. This disease can result in bad breath, swollen gums, and even bone loss that can lead to tooth loss. Combatting this disease requires diligence on your part, as your pets can probably not brush their own teeth! One of the easiest ways to identify something is amiss with your pet’s dental health is to smell their breath. While this might seem strange, it’s incredibly important to catching any unusual oral problems. Now, pets aren’t necessarily known for their impressive oral hygiene already, so even if their breath isn’t minty fresh, that’s normal. What you want to keep a nose out for is harsh or foul smelling breath, regardless of time since the last meal or treat. This can indicate a consistent gum infection in the same way that a human with an oral infection would also have bad breath. Other symptoms of these kinds of problems include excessive drooling, hesitant or strange chewing of food, or reduced appetite. These are the more outwardly obvious signs that you can notice from a distance, but if you take a closer look, there are other signs. 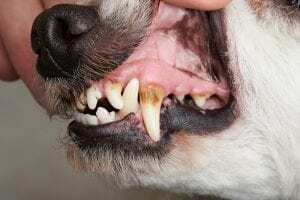 By taking a closer look in the mouth of your pets, any broken, loose, or significantly discolored teeth are clear indicators that something is not exactly right. If you see these signs, it’s a good idea to contact your vet right away. In addition to a professional visit, adding some preventative measures can also improve your pet’s oral health. Pets need to have their teeth brushed regularly, which is at least 3 times a week. 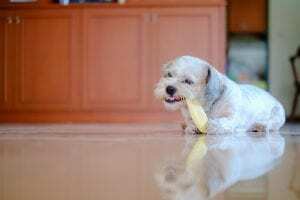 Getting your pet used to this process can take time, and it’s important to note that they are in fact not exactly the same as brushing human teeth. For example, human toothbrushes often have stiffer bristles, and toothpaste for humans contains substances that can be harmful for pets’ stomachs. Unless your pet is already acclimated to dental care, it can be stressful for them. By introducing it over time and including treats as a part of the process, and being warm and welcoming every time you go to get the toothbrush and toothpaste, your pet will begin to relax more during the cleaning, and can even come to look forward to it. If you only use dry or wet food, this can lead to plaque buildup. In the wild our pets would get both crunchy textures as well as soft, and this mixture would help polish their teeth to keep buildup down. Likewise, keeping a mixture of both can go a long way to maintaining the dental health of your pets. Some treats are specifically textured and designed to help reduce plaque buildup on your pet’s teeth. Most pets don’t even notice a difference between these and regular treats! Combining these treats with brushing your pet’s teeth can help ease them into the routine, doing the double job of cleaning their teeth and keeping them happy! Even if you follow all of these tips, there’s no substitute for a professional veterinarian examining your pet’s teeth. They will be able to recognize signs of periodontal disease more easily and can give a more in-depth cleaning than you may be able to at home. Make the plan to improve your pet’s dental health this February and every month of the year! How Can Eucalyptus Oil Help Your Teeth?